SEOUL (May 19, 2005) —- A taekwondo-related nonverbal performance will be staged at the National Theater of Korea in downtown Seoul on May 20, 2005. The performance, titled "Knights of Silver Moon," or "The Moon" in short, will run through May 25 and will be staged again at the Gyeonggi Arts Center in Suwon, Gyeonggi Province, on May 29-30. Victor Kramer is a world-renowned Russian author and director of the 90-minute performance, a co-production between the Gyeonggi Arts Center and Kramer Co. Production. Kramer is better known among Koreans as the producer of "Slava's Snow Show." Attending the production is fellow Russians Valeriy Arhipov, who serves as the ballet-master, and Alexander Mokhov and Maria Lukka, who work as the chief designers. Ticket prices range from 10,000 Korean won (10 U.S. dollars) to 50,000 won. Taekwondo practitioners and staffs at taekwondo-related organizations, like the World Taekwondo Federation, the Korea Taekwondo Association and the Kukkiwon, are entitled to a 30-percent discount. The performance, composed of 13 episodes, depicts taekwondo knights born from eggs defeating all kinds of monsters overnight. In the process, seven taekwondo black-belt holders display their taekwondo skills by breaking pine boards and tiles. Performers are composed of seven taekwondo black-belt holders selected through series of auditions, 10 dancers and four actors. The Gyeonggi Arts Center, which invested 1 billion won in the production, plans to expand the performance abroad starting next year. "I have tried to artistically harmonize the spirit and techniques of taekwondo through the nonverbal performance," said Kramer. "The motive for the knights born from eggs derives from a Korean legend about the founding of the Silla Kingdom." 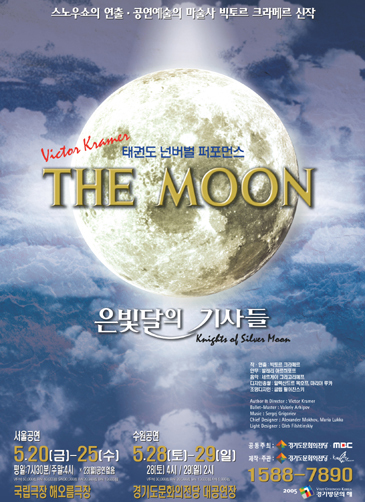 Hong Sa-jong, art director of the Gyeonggi Arts Center, said, "Compared with other nonverbal performances, Knights of Silver Moon is full of imagination, which is sure to enhance the experiences of the audience." "After the first performances, we review them and plan to put on the show abroad starting next year. In that sense, we need much help from the World Taekwondo Federation and other taekwondo-related organizations at home and abroad," Hong added. WTF President Chungwon Choue is scheduled to attend the first performance and meet with senior Gyeonggi Arts Center officials and Kramer for cooperative matters.